As most of our wine enthusiasts know, Donkey and Goat has a “do-nothing” philosophy in which we add as little to the natural process of wine making as possible. Where and how our wine is stored contributes to this, so with this Fact Friday I’ll fill you in a bit on our wine barrels. There’s always markings on the head of barrels that explain what type of grain the oak is made out of, how heavy the toast is, and if the barrel is toasted or not. As you can see in the picture below, this information is given with initials. 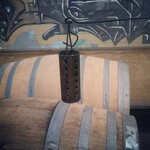 On this barrel the “tg” stands for tight grain, “ht” means heavy toast, and “th” means toasted head. All of our barrels are made out of French oak. They’re from different forests and the wood is aged for two or three years before turned into barrels. 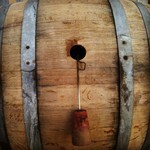 In general, new barrels give the wines stored in them more of an oak flavor whereas old barrels let the wine breathe. 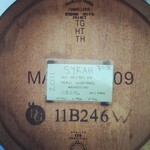 Our barrels are typically purchased after a single year of use at another winery. The vase majority are made in Burgundy by the over 100 year barrel company Francois Freres. We try to keep our barrels for about ten years and once they are no longer usable we make them into planters. Cleaning the barrels is quite a process and it is vital in maintaining the wood as well as keeping them free of bacteria between batches. 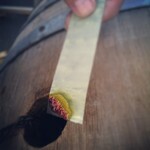 We rinse the inside of the barrel until the water coming out runs clean. After waiting 1 minute, we give it another 30 seconds to make sure everything is out of the barrel. 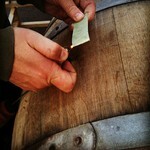 We clean the outside of the barrels as well. It’s especially important to clean the area around the plughole because lots of wine spills around that area which makes it ample of bacteria build up. Then we burn half of a sulfur stick in it to prevent any bacteria from growing inside. Before lighting the sulfur, the barrel should be turned so that the hole opening isn’t facing straight up, but is quarter turned so that all of the smoke doesn’t leak out. Here Jared is lighting the sulfur stick, before putting it into its holder. If we try lighting the sulfur candle twice and it doesn’t stay burning in the barrel then we get rid of the barrel because it’s no longer good to use. After 12 weeks we do the process again, rinse, candle. And voila! 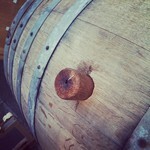 The barrels are ready for use again!